Only woven monofilament geotextiles can provide 'long-term' solutions for nearly any drainage / filtration application, thus making them the filter fabric of choice for bulkheads, subsurface drainage systems and under hard armor. Effective levels of Percent Open Area (POA), a property found critical to long-term filtration is unique to woven monofilaments. Values ≥4% indicate that a sufficient quantity of distinct, measurable, uniform and unidirectional paths through the fabric exist to allow for the release of troublesome migrating fines – the nemesis of all other filter fabrics, regardless of where they approach the geotextile. This allows for the formation of a mini-graded 'filter cake' against the surface of the free-flowing 'filter fabric', and is the designers' only insurance against long-term clogging of their filtration systems. 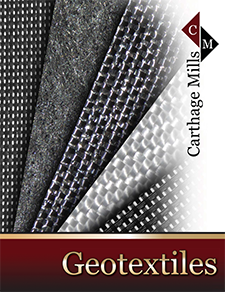 Carthage Mills' woven monofilaments were America's first filter fabrics and the only ones that have been used successfully for more than 50 years (see First 'Filter Fabrics' below). They can be found in literally tens of thousands of projects designed and managed by the US Army Corps of Engineers; all levels of foreign and local governments; and private entities around the world. PERCENT OPEN AREA (POA) – LONG-TERM FILTRATION: Special weave patterns and monofilament yarns deliver the high levels of Percent Open Area (POA) – a property unique to this product series. COST SAVING INSTALLATIONS: Carthage Mills can fabricate custom widths and lengths for your specific project thereby reducing waste and installation times. Individual product selection for each project should be dependent on its primary function, site conditions and the criticality of long-term performance. However, Percent Open Area (POA) is the single most important property to consider when hydraulic gradients are medium to high, long-term filtration is critical, internal migration of fines may occur, and/or even partial clogging of the fabric could result in failure of the project. Technical Note: In an independent study to evaluate the hydraulic performance and clogging potential of four major types of geotextiles, it was determined that Percent Open Area (POA) is the single most important property to consider when long-term filtration is critical. Download an easy to read summary of this important work at Independent Research on Fabric Clogging; and also Why Percent Open Area?, which explains its role, function, and importance in the mechanics of geotextile filtration. America’s first geotextile - Filter X by Carthage Mills - was made of PVC and featured in their groundbreaking and world’s first “Filter Handbook”. With the later development of polypropylene, Filter X was eventually replaced with Poly-Filter X, now called Carthage 6%, and soon became the most specified geotextile around the world. Because of severe storms that would hit the State of Louisiana, Carthage introduced Poly-Filter GB to handle the resulting severe hydraulic gradients and their poor soils. Now called Carthage 30%, it was impossible to clog with naturally occurring soils and is only available at Carthage Mills. What did the “GB” in Poly-Filter GB stand for?